In 2017 the Martinborough region experienced a very warm vintage. The warm weather meant that flowering and the fruit set were very good and tannin and phenolic ripeness occurred easily and early. Because of the summer heat, we also saw excellent flavor development begin in early March. This meant that we were able to harvest the grapes at good ripeness, without seeing excessive sugar levels and ultimately ensuring one of our best Sauvignon Blanc wines in recent years. Stonecrop is a member of the New Zealand Sustainable Winegrowing program and is an accredited SWNZ vineyard. The practice of Sustainable Winegrowing helps to improve the performance of our vineyard with a focus on the conservation of natural resources. We are committed to using natural methods to control pests and diseases, which means a reduction of chemicals and sprays, creating a healthy environment for soil and vines resulting in the production of the best quality grapes possible. The fruit was 100% destemmed, gently pressed and cold settled for 3 days. It was then slowly fermented for 16 days at 16-17C. Following 4.5 months of wine lees contact in stainless steel the wine was bottled in December 2017. Nose: Fresh tropical fruit notes with citrus minerality. Palate: Generous fruit concentration and vibrancy with good acidity and minerality that provides an elegant and crisp finish. New Zealand Sauvignon Blanc is renowned for its crisp, clean and lively character but there are subtle differences between Martinborough Sauvignon Blanc and Marlborough. Martinborough is drier in Autumn than Marlborough and the harvest is generally later, this allows us to give our grapes more ‘hang time’, resulting in a riper style sauvignon blanc; a wine that is more complex and balanced with good weight and minerality along with elegant aromatics and a creamy texture. 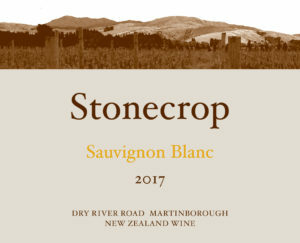 The unique climate and soil of the region and low cropping all contribute to the excellent concentration, texture and depth found in a Martinborough sauvignon blanc. Most Martinborough vineyards are small and are typically family owned with low yields which enables winemakers to dedicate time and effort to producing handcrafted wines of distinction. Martinborough Sauvignon Blanc – Riper and more rounded with melon, tropical fruit and citrus flavors.